As any home mechanic knows, sooner or later you are going to have to lift your engine out of your vehicle. Paying a garage to lift your engine for you will cost you rather a lot so it’s worth considering investing in an engine hoist. While they are more expensive than your average tool you will find that after only a couple of uses or less they have covered the initial cost. Engine hoists can also be called engine lifts (not to be confused with car lifts), engine cranes or more exotically cherry pickers (allegedly because in 1944 Jay Eitel invented the first one to make picking cherries during his school holidays easier). Specifically designed for lifting engines, they need to be strongly made from high quality metal. This makes the hoists heavy so you need to make sure you choose a model with wheels so you can move it around your garage easily. These are quite big tools so it’s also a good idea to look for ones that fold away to take up less space. An average dry car engine weighs between 300 and 800 pounds, but that increases when you add on the weight of fluids like oil and accessories and the transmission that isn’t usually separated. Obviously, bigger cars have bigger engines that weigh more and older engines tend to be made of heavier metals. Therefore you need to double check the specification of your hoist and make sure that it’s more than capable of lifting the weight you need. You also need to think about exactly how high you need to lift your engine to clear your hood. To help you out, below are reviews of the three engine hoists we think are the best options for the money. Click the ‘More Details’ buttons above for detailed specifications for each product, or read each of our reviews of each of the top 3 engine hoists available in 2019. The Goplus engine hoist isn’t just well thought of us by us but it is also one of the top sellers on Amazon. It’s very reasonably priced but they haven’t skipped on the essentials. It’s made from heavy duty structural steel, which is durable, sturdy and holds its shape without warping. To make it easy to clean and so it can be used both inside and out, the cherry picker has a powder coated finish. The paint is corrosion-resistant and anti-rust and a bright glossy red. The Goplus engine hoist has four adjustable positions that should cover any task you require it for. When the boom is closed it has a capacity of 2 tons, then it can be extended to the next setting that can take 1.5 tons, the next extension will lift 1.5 tons and when fully extended it has a capacity of 2 tons. The fully extended boom measures 63 inches and when it’s closed it is just under 42 inches. When the boom is at its fullest extension it can lift to a height of about 105 inches and when the boom is fully retracted it can lift to a height of about 88 inches. The Goplus cherry picker is designed with a low clearance so it can slide under most cars without having to raise it with a jack first. When fully set up the Goplus cherry picker measures about 65 inches long by 38 inches wide and 60 inches high. 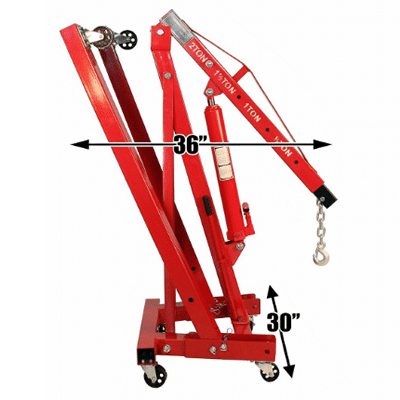 The heavy lifting is handled by a long lasting 8-ton hydraulic cylinder. The lifting bar has a grip to make it more comfortable to use and clips away against the main mast when not needed. For added safety the hydraulic cylinder has a slow release. More DetailsGoplus have put some thought in to how you are going to move your engine hoist around. There is a push handle provided with rubber grips to make it more comfortable to manoeuvre. There are six heavy duty wheels that move through the full 360 degrees giving you full control and a wide range of movement. Storage is made easier by the foldable legs. Each leg has a two pins with a ring on each to pull it out. Once removed, the legs can be moved vertically and the pins replaced to keep the legs up. An excellent engine hoist with a lot of great features. It is well built, perfect for removing an engine for your truck and will last you a long time, even if you plan on using it several times a day. The GoPlus can be used for lots of tasks in your garage and home, not just with engines, and with its easy manoeuvrability there really is a lot to love about this cherry picker. Another good option to consider is the Dragway Cherry Picker. It’s the most expensive hoist of the three we recommend but it is an excellent machine. The reason to shell out a few more dollars is that the Dragway is very solidly built from high quality thick steel. The legs are 3 inch square and the steel is 0.12 inches thick. The vertical mast and the main frame are made from premium steel that is 0.31 inches thick. To provide more strength and stability to the frame there are two steel support plates on each side. Even the smaller components are made from high quality metal – the caster wheels are steel and the chain is forged steel. So what can the Dragway engine hoist lift? The boom has four settings and how much it can lift depends on how far you extend the lifting arm. When the boom is closed it can lift 2 tons and it is 48 inches from the ground. The first extension setting can lift 1.5 tons and the next can lift 1 ton. When the boom is fully extended it is 102 inches from the ground and it can lift ½ a ton. Once you have chosen the appropriate setting, to actually start lifting you take the lifting bar from its clip, slide it into the holder and start pumping. An 8 ton hydraulic ram does the hard work for you. To lower the hoist back down you loosen the bleed valve on the bottom of the jack. More DetailsThe Draqgway cherry picker weighs 165 pounds. It comes in two boxes and requires putting together. The packaging could be improved as the nuts, bolts and washers tend to be loose and so easily fall out of any holes or damage that may occur in transit. To help make it more manoeuvrable, the engine hoist has 6 fully swivelling castor wheels, each 3 inches. The legs are about 32 inches apart as the hoist is designed to be wheeled in between the front tyres. The top of the legs are about 7 inches from the ground which gives a useful low clearance. When the engine hoist is fully set-up to use it measures 65 inches to the end of the legs, 37 inches wide and around 41 inches high. To make it easier to store, the engine hoist can be compacted. The boom can be lowered and the legs repositioned almost vertically using easily removed pins. This reduces the measurements to 58 inches by 37 inches by 22 inches. For your peace of mind there is a 1 year warranty and customer services get high praise for their helpfulness. 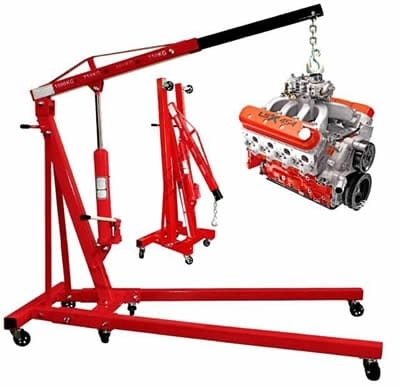 The Dragway Tools 2-ton folding hydraulic engine hoist is our top choice for a reason. Its construction is simply excellent and if you take care of it, this portable cherry picker will last you for years to come and help you effortlessly remove countless engines with ease. If you are familiar with Torin then you will know what to expect – their products are very similar to their competitors but slightly cheaper and bright red! That’s exactly the same story with this hoist. It is very similar to the Dragway but a little cheaper and slightly less good quality. One of the ways Torin has saved money is in the packaging. It comes in one box, which when it weighs 165 pounds mean it tends to arrive torn and battered. The nuts and bolts are loosely fastened into their holes but unfortunately the jostling and vibrations of transportation mean that they frequently come free and inevitably fall out of the holes in the box. So you are probably going to need to be prepared to get some extra bits and pieces. Assembly is straight forward unless, as some customers have reported, the bolt holes are out of enlignment. Torin gives measurements for their cherry picker of about 5 foot high by 21 inches and 6 inches, making it smaller than the other two we recommend. The boom can be lowered and the legs raised when not in use so it takes up less space which is great feature. The top of the legs are just over 7 inches from the floor so it should have the clearance to slide under most vehicles. The boom has the usual four settings, when fully extended it can lift 0.5 tons, the next setting can lift 1 ton, the next 1.5 tons and when fully retracted it can lift the full 2 tons. 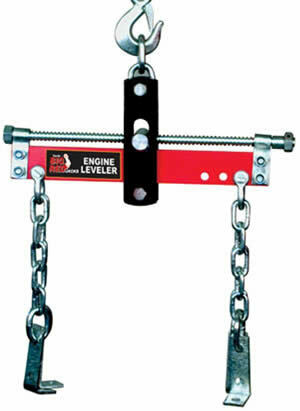 One of the selling points of the Torin engine hoist is that it can get very low, giving it a lifting range of 1 inch up to about 79 inches. More DetailsThe lifting is carried out by a heavy duty 8 ton long ram. The lifting bar clips away but it doesn’t have any kind of grip so it might be an idea to wear gloves while using it. There are 6 castor with full 360 degree turn so the engine hoist is easy to move about. The wheels are not as heavy duty as on some other models. There’s a convenient handle halfway up the main mast to help push it around and this handle does have a grip on it to provide some cushioning. The frame is made from high tensile steel tubes and there are two steel support plates to increase the strength and stability. While there have been no reports of problems with the load bearing welds there has been lots of customer criticism of the non-critical welds. Customer service is excellent and the engine hoist comes with a 1 year warranty. Staff are helpful and friendly and replacement parts are sent out quickly. 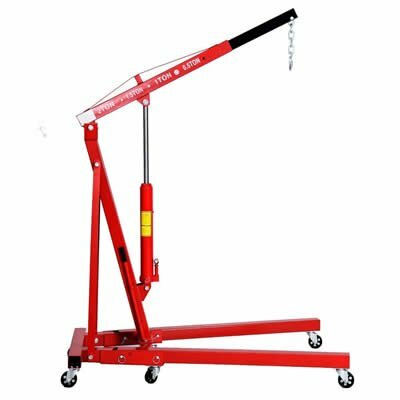 The Torin Big Red 2 ton engine hoist is a good solid choice and can be found on Amazon cheaper than the other two portable cherry pickers in our review. Yes it has some issues, like the packaging or the quality is not as good as the Dragway, but it is still a very good tool that gets the job done, and at the end of the day, that is what counts, right? Let’s start with the obvious – read the manuals! Your car engine is expensive and heavy and you don’t want any accidents. Some engines are designed with lifting points you can simply attach a hook to, others you have to bolt a chain to the engine block. It’s also a good idea to give your hoist a look over to make sure all the nuts and bolts are fully tightened, the hydraulics haven’t leaked and anything that might need it is lubricated. Take a moment to think about what you are wearing too. Loose fitting clothes can get caught and tangled and you are more than likely going to get dirty. A common issue with modern cars is that the engine doesn’t lift straight out of the hood. You will probably find you have to tilt it first one way, then another. To help with this it is probably worth investing in a load leveller. These handy devices attach to the hook of your hoist and have a two hooks and a crank that easily adjusts the angle of the engine. A leveller provides a much more stable left and will stop the engine spinning while being raised and moved. They do not cost very much and we would actually recommend the Torin load leveller, which is the cheapest option on Amazon and will do the job perfectly for less than $30. Obviously you need to make sure that everything you are using – bolts, chains, leveller etc – are strong enough to take the weight. Remember too that the tools add to the weight being lifted, so take that into account when you are doing your calculations. OK so you are ready to lift. Wheel the cherry picker in between the front wheels and under the bonnet. Adjust the boom to the appropriate length, taking into account that it can lift less as it gets longer. 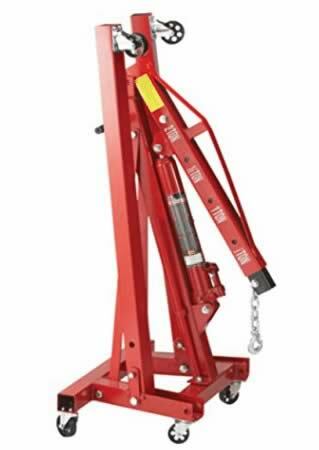 Ideally the boom should not extend past the end of the legs so there is no danger of the hoist tipping forward. Attach the engine to the hoist. Slide the lift handle into the bottom of the hydraulic ram and pump the handle. To be safe, lift the engine just a little bit, then have a good look around to make sure you have disconnected everything. Once the engine is clear of the hood, wheel the hoist backwards and then manoeuvre it to where you want to place the engine. Ideally you will be working on a smooth surface such as concrete. If you are working on a rough surface such as gravel it would probably be worth laying down some plywood so the hoist can move smoothly. Remember this is a heavy load you are moving and you need to be careful. It doesn’t really need to be said but you would not place yourself or anything valuable under the engine while it is being held by the hoist. Even the best tools in the world have the potential to fail and it’s not worth taking the risk. You can place the engine on the floor but it would be a good idea to put it on a bench, or even better on an engine stand. You usually take your engine out so you can work on it so it helps to have it at a suitable height. Most engine stands rotate to make it even easier to get to work. 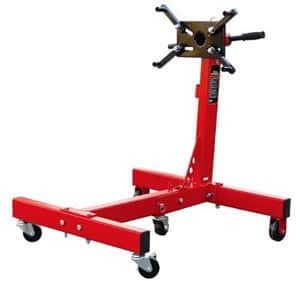 A helpful tip is to take the rotating head off the stand and attach it to the engine, then lower it until the head slides back onto the post of the stand, rather than trying to accurately lower the engine into correct alignment with the stand. Please bear in mind that hoists are designed for raising and lowering weights, not holding your engine overnight or while you work on it. To lower your engine, you loosen the bleed valve on the bottom of the jack. Be cautious when loosening the valve as this is a much faster process than raising the hoist. When you have finished you simply reverse the steps above, fold up your engine hoist and stow it away in a corner until the next time you need it. If you are unsure of how to use an engine hoist, take a look at this great video to get a better idea. An portable cherry picker can be used for all sorts of situations in a home garage, whether you want to put heavy objects on the back of a pickup truck or in a van, or if you want to safely and effortlessly move heavy items from one side of your garage to the other. All 3 of the above reviewed engine hoists are excellent and will help you effortlessly remove and install a car or pickup truck engine. We would be happy using all three but our personal favourite because of its build quality is the Dragway Tools 2-ton folding hydraulic engine lift. If you can afford the extra cost, it simply is outstanding.